Volker Hans Haase M.D., Dr.med. Chronic kidney disease (CKD) represents a major health burden worldwide. In the United States the prevalence of CKD in the general population (stages 1-5) is estimated to be between 10 and 15% (6.3 % for stages 3–5), with diabetic nephropathy and hypertension being the leading causes (USRDS, 2005-2010). The CKD core provides a collaborative platform for investigators with an interest in understanding the cellular and molecular mechanisms that underlie the pathogenesis of CKD and its complications. This working group uses advanced mouse genetics, metabolomics, biochemical, transcriptional and state-of-the-art imaging approaches to identify novel therapeutic targets to improve the life of patients with CKD. The Haase lab uses state-of-the-art mouse genetics, biochemical and metabolomic approaches to investigate the role of oxygen sensing and the hypoxia-inducible factor (HIF)/prolyl-4-hydroxylase domain (PHD) pathway in the pathogenesis of CKD and its complications. The Bhave Lab is interested in the assembly and function of basement membranes and extracellular matrix in kidney disease. By studying matrix biochemistry at a fundamental level, we hope to gain insight into renal glomerular and tubulointerstitial fibrosis which represents the common final pathway to injury in nearly all kidney diseases. Our group utilizes cell culture systems, molecular biology, biochemistry, mass spectrometry, and mouse genetics to answer questions of interest. The Breyer lab is studying the role of prostaglandins in renal physiology and hypertension. We are interested in the synergism between other pressor hormones and prostaglandins in determining the pressor or depressor effect of prostaglandins. The Fogo laboratory studies mechanisms of progression of kidney disease and potential regression of glomerulosclerosis. The laboratory focuses on key interactions of glomerular cells, and the effects of the renin angiotensin system and plasminogen activator inhibitor-1 (PAI-1) on these interactions, using genetically engineered mice and cell culture. The Gewin lab focuses on how TGF-beta and other growth factors differentially modulate the epithelial, mesenchymal, and inflammatory responses to injury, all of which are critical to chronic kidney disease progression. Genetic mouse models and cell culture techniques are used to determine the cell-specific effects of these growth factors in the context of renal injury. The Harris lab has had a longstanding interest in mechanisms of progressive kidney injury and in developing and testing potential therapeutic interventions to slow progression. Recently, the lab has been investigating underlying mechanisms and potential targets of the epidermal growth factor receptor signaling pathways. The Kapitsinou group is interested in understanding mechanisms by which the endothelial oxygen sensing machinery regulates responses to kidney injury. Current studies focus on exploring the cytoprotective effects of endothelial PHD2/HIF axis utilizing transgenic mice, molecular biology, biochemical, metabolomic and cell-culture approaches. The Pozzi lab studies the role of collagen binding receptors such as integrins and discoidin domain receptors to progressive kidney injury. Based on the finding that genetic deletion and pharmacological inhibition of these receptors play a protective role in the course of kidney injury, the Pozzi lab is devising new and selective tools to target these receptors and their downstream pathways in chronic kidney disease. 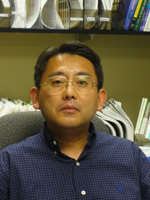 The Takahashi lab has been investigating the pathogenesis of chronic kidney disease, including diabetic nephropathy and renal fibrosis. The lab has defined an important role of eNOS and SOD enzymes in diabetic nephropathy. In addition to these enzymes, the lab is currently studying the role of CD148 tyrosine phosphatase in chronic kidney disease..
End stage renal disease carries with it mortality similar to or worse than some cancers. New therapies are needed. We are developing preclinical gene-based approaches for therapy of kidney disease and its complications.The Wilson lab is interested in developing a novel cell therapy for anemia of chronic kidney disease and gene transfer to kidney in vivo for disease correction. The Zent laboratory studies the role of cell-extracellular mechanisms regulate progression of chronic kidney disease. The major techniques used to answer these questions include the making and characterization of transgenic mice, cell biology and biochemical techniques as well as structural methodologies including 3-dimensional nuclear magnetic resonance. The Zhang lab is studying the interactions between hormones (such as dopamine and angiotensin II) and arachidonic acid metabolism pathways (such as cyclooxygenase, lipoxygenase, and Cytochrome P450 pathways) and their potential roles in the pathogenesis of CKD.